This open-pollinated, lemon-scented basil variety is likely Southeast Asian in origin. Lemon basil leaves can be added to any cooked dish that usually calls for regular basil. The fresh leaves have an amazing, strong lemon-scent but are milder and closer to regular basil in flavour. Fresh lemon basil leaves make an excellent lemon-scented tea when infused with boiling water. Fresh lemon basil leaves are great for making a delicious lemon-scented pesto when combined with pine nuts, olive oil, black pepper, garlic and Parmesan. This unique lemon pesto is particularly excellent for seasoning fish. Lemon basil plants produce edible white flowers, but are annuals so they'll die shortly after they finish flowering. Lemon basil plants that have been left go to flower provide a nectar source for insect pollinators as well as the adult stages of predatory insect species such as lacewings and hoverflies. Lemon basil is an easy to grow annual herb. Lemon basil grows quickest in full sun, although growers in warmer climates may instead prefer to grow it in part shade to reduce heat stress on plants during the hottest part of the day. Lemon basil grows best when planted into a fertile, free-draining soil rich in organic matter. If your soil is sandy, heavy with clay or lacking in organic matter you can improve it by placing down a layer of compost or well rotted manure prior to planting lemon basil. Lemon basil shouldn't require additional fertiliser to grow well, although if growth is slow top dress around plants with a nitrogen-rich organic fertiliser such as blood and bone. Water lemon basil regularly, plants that are water stressed are more likely to bolt to seed. Pinch out flowering tips as they form to encourage new side shoots to branch out, this will create bushier growth and extend the harvest period. Lemon basil plants can be successfully grown in containers, ideally with each one being planted into a pot of at least 200mm diameter. 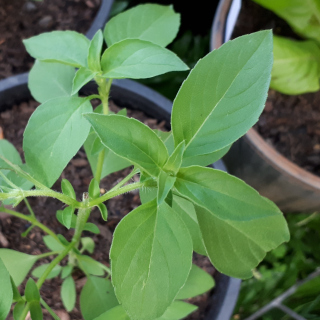 In cold, mountainous or temperate regions of Australia sow lemon basil seeds from early Spring as soon as any chance of frost has past through to early Summer. In frost-free, subtropical regions of Australia sow lemon basil seeds from late Winter to early Summer for optimal growth. Lemon basil seeds can be sown any time of year in the tropics. Sow lemon basil seeds 6mm deep. For optimum plant vigour sow several seeds per hole and thin to the healthiest seedlings a week after germination. Space lemon basil 20cm apart to give their root systems sufficient room to uptake nutrients and moisture from the surrounding soil. Lemon basil seedlings that are overcrowded will bolt to seed before they reach their full potential size. Lemon basil seeds can be sown direct or started in punnets. Lemon basil seeds germinate quickly and consistently with seedlings taking between 7 and 10 days to emerge after sowing. Lemon basil takes 12 to 13 weeks of growth to harvest whole plants, although individual leaves can be picked earlier. Pick out shoot tips early and regularly to encourage bushy growth.